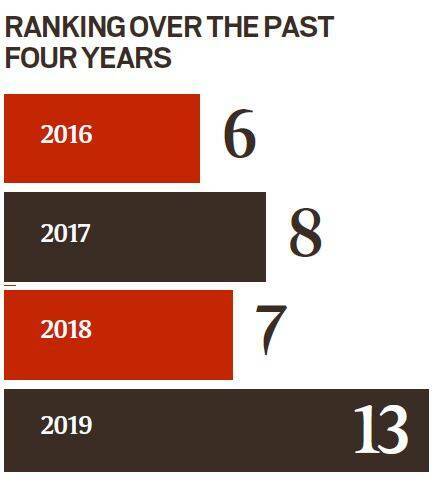 “We did not expect to fall so much,” said a senior Delhi University official, just a few days after the National Institutional Ranking Framework (NIRF) placed the varsity at rank 13 this year among all universities in the country, six places down from last year. This is the first time since the ranking by the Ministry of Human Resource Development began in 2016 that DU has not made it among the top 10 varsities. Seven DU colleges, however, featured in the top 10 this year. Out of five parameters, DU got better scores in three than last year. But problem areas, in which scores have dropped, are student-teacher ratio with “emphasis on permanent faculty”, budget utilisation, and number and quality of publications. Among the biggest factors that contributed to the decline in score is lack of permanent faculty — an issue raised several times by the DU Teachers’ Association. DUTA president Rajib Ray said there are around 3,900 ad hoc teachers out of a total of roughly 10,500 faculty members. According to the university, they are unable to hire permanent faculty as the University Grants Commission (UGC) stayed recruitment last year, due to an ongoing case in the Supreme Court related to calculating reservation in teaching positions. “We recruited 145 teachers in the Faculty of Law and the Department of Education in the beginning of last year; we would have done more had recruitment not stopped. That would have also improved our student-teacher ratio, which is somewhere around 23:1 right now for PG courses,” said a senior DU official. The teaching, learning and resources (TLR) category, in which DU’s score has dipped from 52.52 last year to 47.87 this year, comprises factors such as “student strength including doctoral students”; “faculty-student ratio with emphasis on permanent faculty”; “combined metric for faculty with PhD (or equivalent) and experience”; and “total budget and its utilisation”. At the Delhi School of Journalism, for instance, which began admitting students in 2017 and is not affiliated to any college, there is no permanent faculty. “We have one teacher hired on a contractual basis, and about 34 others who are guest teachers,” claimed a student. But it’s not just the student-teacher ratio which is being affected by lack of appointments. It is also taking a toll on research, say teachers. This is reflected in the research, professional practice and collaborative performance (RPC) parameter, which fell from 58.16 out of 100 in 2018 to 53.79 now. “DU is seeing many teachers retire, but permanent appointments aren’t taking place accordingly. In some departments, they are managing without hiring ad hocs, by reducing the number of optional papers offered to students. In others, where ad hocs are being hired, they are not able to give the research output which senior professors give,” said former Executive Council (EC) member Abha Dev Habib. Associate Professor Vijaya Venkataraman, who teaches in the Department of Germanic and Romance Studies, said research output is also closely linked to promotions, which have been stopped for years. “In our department, two professors have retired since 2017. We have got two ad hoc replacements, but they cannot guide PhD students. Also, the number of PhD students a teacher can guide depends on their designation. So, since associate professors have not become professors for years, they are only able to guide six PhD students instead of eight. This is adversely affecting research output,” she said. According to the administration and teachers, another major reason for research output falling is the decrease in research funding to and from the university. “Our papers in Journal of Web Science and SCOPUS have actually increased from 5,205 and 5,630 in 2016-17 to 5,662 and 5,926 in 2017-18 respectively. But it’s also true that our research funding fell from Rs 60 crore to Rs 50 crore. This could have had an effect,” said a DU official. The factors that contribute to the RPC parameter include “combined metric for publications”; “combined metric for quality of publications”; “IPR and patents: filed, published, granted and licensed”; and “footprints of projects and professional practice and executive development programs”. Venkataraman, too, said the research grant which DU would give has stopped since 2016. “Humanities departments would get up to Rs 1.5 lakh and science departments would get up to Rs 3 lakh. This amount was on paper, but departments would still get about Rs 75,000 to Rs 1 lakh at least. It was not a huge amount of money, but that would help. Now even that has stopped,” she said. DU’s problems are also compounded because it has stopped subscribing to INFLIBNET through which it accessed various journals like SCOPUS, Science Direct, Science Find, etc. “These journals have now been discontinued and are affecting academics. DU’s libraries are also in a bad shape. After the OBC expansion, the number of students increased, but there was no increase in library infrastructure or appointments. We have written to the V-C but to no avail,” said EC member Rajesh Jha. The situation continues to persist till date, said Jha. A DU official, however, said the university had already subscribed to various journals, and has written to the UGC asking for funds for others. “They have been supportive as of now. With the money we get from there, we will start some subscriptions like Science Direct,” he said. The NIRF website also shows that DU’s expenditure on seminars/conferences/workshops dropped from Rs 1.06 crore in 2016-17 to Rs 81.81 lakh in 2017-18, and the expenditure on salaries of teaching and non-teaching staff dropped from Rs 553 crore in 2016-17 to Rs 520 crore in 2017-18. One reason for the former, claimed teachers, is the new financial rules implemented from late 2016 as per the Ministry of Finance’s order. “As per the new government rules, procurement of more than Rs 15,000 has to be done through e-tendering. Earlier, this limit was Rs 2 lakh. This is becoming a big hassle for departments since even for small things like decoration for seminars, they have to go through this lengthy process. Several of them have started pulling back from organising such events,” said Jha. The NIRF website also shows that DU spent much less on “creation of Capital Assets” apart from land and building in 2017-18 than it did in 2016-17. While it had spent roughly Rs 13 crore in 2016-17, the expenditure in the following year dropped by 50% to roughly Rs 6 crore. This, a DU official explained, was because of the NIRF review falling in time of a “transition period”. “Right now, projects worth Rs 500 crore are in the pipeline. We are looking to build more hostels and expand the Faculty of Law infrastructure. For the hostels, we are even looking to bring ONGC on board for funding; we have reached an advanced stage of talks with them. It’s not that DU is not spending on creation of assets; it was just a transition period for us,” he said. DUTA president Ray said the ranking has been a result of a “combination of factors”. “It’s because of the problem of ad-hocism in which certain departments are only being run by ad hocs, along with stopping of research grant, new finance rules and several other factors,” he said, adding that he did not want to give too much weightage to ranking. The DU administration, too, has its reservations about the ranking process. “Our score in QS (World Universities) ranking is much better compared to other universities, but not good in NIRF. We also need to assess the way the ranking parameters are being made. They have a separate ranking for DU colleges, but the university is the one that makes the syllabus and conducts the examination. Is that being taken into account?” said an official. JNU and Jamia, which are above DU in this year’s ranking, have a score of 68.68 and 58.07 as compared to DU’s 57.59. JNU, which stands at rank 2 among universities, has a score of 99.87 on “graduation outcome” — the highest among any university. “During the last three years, our sponsored research funding has gone up significantly to about Rs 105 crore, which is a reflection of the state-of-the-art research done at JNU. The university has also expanded its academic programmes with the establishment of the School of Engineering and Atal Bihari Vajpayee School of Management and Entrepreneurship. Many of our faculty members are highly cited authors and publish in highly ranked journals such as Nature Communications…,” said JNU V-C M Jagadesh Kumar. However, DU officials feel the comparison with other universities is not valid. “DU has its own structure and scale, which none of these universities have. We have lakhs of students and several colleges under us, which makes our assessment different from any other university,” said an official. This does not mean that DU is taking the ranking lightly, with the Pro Vice-Chancellor calling a meeting of top officials to analyse why it dipped. “There is no official committee, but the Dean Academics, Convenor of Internal Quality Assurance Cell, Pro Vice-Chancellor and two senior professors are looking into the ranking and analysing the reason behind the dip. We are hopeful that we will do better next year,” said DU Registrar Tarun Kumar Das. What the Principal says: No response from John Varghese.